I went through a big overhaul of my curriculum recently, digging deep into cooperative groups, more creative composition, and authentically student-led inquiry. I was well into it, however, when I stopped to reflect and realized that movement—which had once been an integral part of my daily plans—had all but disappeared! With all that PYP teachers need to cover, and the aim to allow as much student initiative as possible, it’s easy to run out of time for all our curricular content. But I truly believe that the best way to begin to understand much of that content is with the whole body. 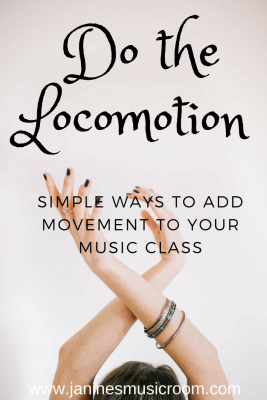 Locomotor activity allows students to really feel the rhythm of the music, the articulation, the dynamics, the style. It helps them to understand tempo as the Italians do: andante refers to walking, allegro to happiness, and largo to breadth and size. None of these terms is a direct translation of a speed, so why not experience them on a deeper (or is it higher?) level? For the youngest students, I started just by playing a steady beat, using a ”boom-chick” in the left hand, with a simple right hand melody. They moved to the beat. I also experimented with one class that particularly struggles with keeping their eighth notes even, and I had them move to four-beat rhythm patterns (ex. Ta, ta, ti-ti, ta). For the middle primary students, I assigned their feet to follow the left hand notes, and their hands to clap to the right hand notes. I started with one at a time, then moved them into unison, and finally moved into multiples of two or four (ex. clapping half notes while stepping the eighth notes). The oldest students extended this when I would stop playing for a measure or two while they kept moving. The students were very happy to be getting up and moving around, and it definitely improved the level of concentration that followed. Movement is back, and here to stay. How often do you incorporate movement with your different age groups? What kinds of movement activities are standard in your classroom?